For the first few hours after any new “bombshell” Russia-gate story comes out, my social media notifications always light up with poorly written posts by liberal establishment loyalists saying things like “HAHAHA @caitoz this proves you wrong now will you FINALLY stop denying Russian collusion?? ?” Then, when people start actually analyzing that story and noting that it comes nowhere remotely close to proving that Donald Trump colluded with the Russian government to steal the 2016 election, those same people always forget to come back afterward and admit to me that they were wrong again. And of course they didn’t. They weren’t meant to. They were meant to absorb The Guardian’s false claims as fact, add it to their Gish gallop mountain of false evidence for Trump-Russia-WikiLeaks collusion, and then be shuffled onward by the relentless news churn of the corporate propaganda matrix like always. But I’m never going to let them forget that this happened, and neither should you. This is obviously absurd for two reasons. The first reason is because no Kremlin operative could possibly make Luke Harding look worse than Luke Harding already did in his pathetic, fumbling attempts to argue his case for collusion while promoting his book Collusion to a less-than-sycophantic interviewer in December of last year, in which Harding grew frustrated and hung up on his own interview. The second reason is that there is another far more likely possibility than the two offered by Politico’s anonymous spook. 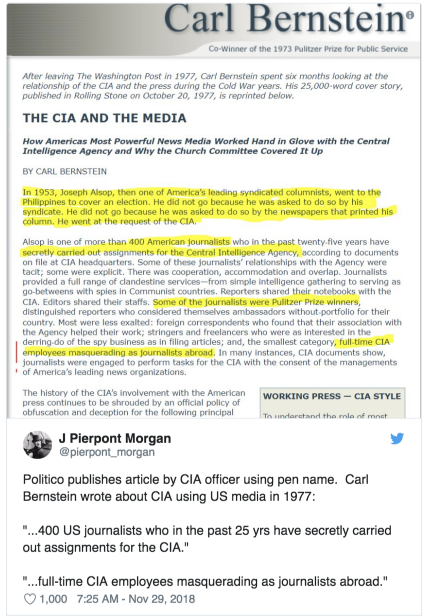 Former Guardian employee Jonathan Cook explains that from what he learned while working at the outlet, the most likely explanation is that the editors permitted the article to be published because its anonymous sources came from within an intelligence or defense agency. As we’ve seen time and time again, from the Iraq WMD narrative to the Russian hacking narrative, western mass media outlets have a ubiquitous standing policy of printing assertions by opaque, dishonest, unaccountable government agencies as objective fact. 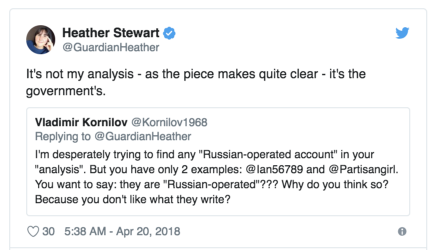 When asked why she unquestioningly printed a false assertion that real social media users who deny any connection to Russia were Russian “bots”, the Guardian’s own political editor Heather Stewart unapologetically stated, “It’s not my analysis?—?as the piece makes quite clear?—?it’s the government’s.” As long as it comes from the government, the mass media stenographers will print what they’re told to print. But tell me more about how awful RT is because it’s “state media”. “That at the very least hints that the Guardian thought they had ‘insurance’ on this story. And the only people who could have promised that kind of insurance are the security and intelligence services?—?presumably of Britain, the United States and / or Ecuador. Forgiveness is overrated. Forgiveness is a key foundational element in most abusive relationships, wherein the abusee is manipulated or bullied into forgiving the abuser again and again, without ever holding a grudge. This is true of a battered spouse, and it is true of an oppressed populace. The ability to hold a grudge is therefore of paramount importance in fighting the propaganda machine on which our rulers have built their oppressive empire. Otherwise we will be shuffled forward in the news churn, just like the goldfish-brained Russia-gaters who are moved along from one false story to the next into the amnesia of the endlessly spewing news churn.